The Only Live Ant Habitat designed like a Real Ant’s Colony! Mail the coupon in the kit and receive a generous supply of live ants, ready to dig in. Watch as they work to create an amazing network of underground tunnels, walkways, and secret chambers. The habitat’s unique “cross-cut” design features an oversized tunneling chamber for above and below ground observation. The super-stable base makes tipping over virtually impossible. Features a realistic double-sided viewing area, escape-proof locking lid, special AntHill® fill sand, fun ant activities and complete instructions. The Only Live Ant Habitat designed like a Real Ant’s Colony! Mail the coupon in the kit and receive a generous supply of live ants, ready to dig in. Watch as they work to create an amazing network of underground tunnels, walkways and secret chambers. The habitat’s unique “cross-cut” design features an oversized tunneling chamber for above and below ground observation. The super-stable base makes tipping over virtually impossible. 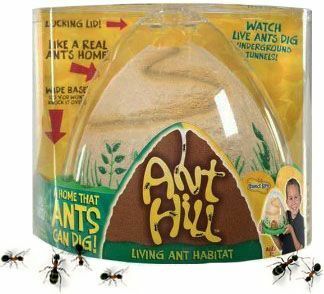 Features a realistic double-sided viewing area, escape-proof locking lid, special AntHill® fill sand, fun ant activities and complete instructions. Ages 6 and up with adult supervision.